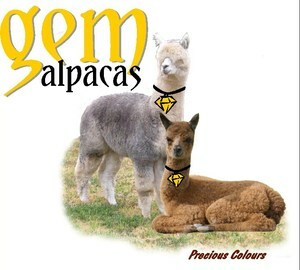 Trevor and Jill Allan are Gem Alpaca Stud here in Fairlie, South Canterbury, New Zealand. We're based in the beautiful Mackenzie Country. Extremely hot summers and very cold winters, just the way the alpaca like it. We purchased our property in Fairlie in 2002. Moving from Dunedin us city slickers have adapted really well to country life and community living. We've created a few firsts for Fairlie. When we arrived we had Gizmo our Rainbow lorikeet, an absolute wee character of a bird, loved by all who met him. No one else had one of these funny birds here. Then we introduced the alpaca to the community, that was a big hit, these new long necked sheep things. We soon got the towns folk educated to realise they weren't sheep, far from it. We have school visits to the farm taking in Genetics lessons and much more. A couple of years later we added the Llama to the mix and have been taking them round the town through the school and to pet days at Kindy and even through Moreh House our local fully community supported elderly folk home. So after 16 years of breeding these stunning alpaca our fibre is now high quality and we have sufficient alpaca to have our own little shop on the farm. So on the 3rd June 2011 The Paca Shack was born. We breed mainly Browns and Greys with a few other colours in between. But it gives us a big range of natural colours to sell. None of our own yarn is dyed. They produce such a cool range of natural colours that we buy in any coloured yarn we sell.